Leersia hexandra Swart, Prodr. Veg. Ind. Occ. 21. 1788; Honda, Monogr. Poac. Japon. 6. 1930; Hsu, Fl. Taiwan 5: 377. 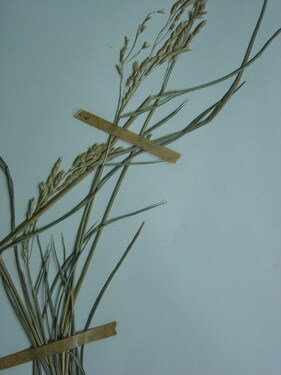 1978; Koyama, Grass. Jap. Neighb. Reg.23. 1987. Loosely tufted perennial; culm base decumbent, rooting at nodes; swollen nodes retrorsely puberulent; ligules membranous, 1-2 mm long; leaf-blades narrowly linear-lanceolate, 3-15 cm long, 2-6 mm wide, scabrous. Panicle loose, narrowly elliptic. Spikelets 3-5 mm long, 1.2-1.5 mm wide, contracted at base; lemma 5-nerved, boat-shaped, hispidulous, bristly-hispid on keel; palea same texture and length as lemma, 3-nerved. TAIPEI: Tanshui, Hsu 189. TAOYUAN: Taoyuan, Chuang 4600.. NANTOU: Chinshuikou, Kao 276. TAINAN: Hsinhua, Hsu & kuoh 13657. KAOHSIUNG: Fengshan, Chuang 4148. PINGTUNG: Tungkan, Kao 128. Pantropics; suthern Ryukyus, Taiwan, and Hainan in eastern Asia.